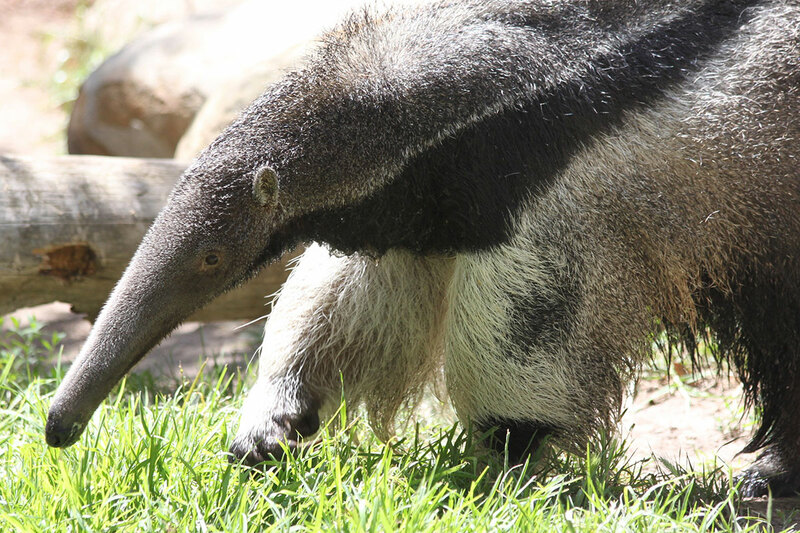 Twenty-seven giant anteaters have been born at the Santa Barbara Zoo since 1975. Which is which? 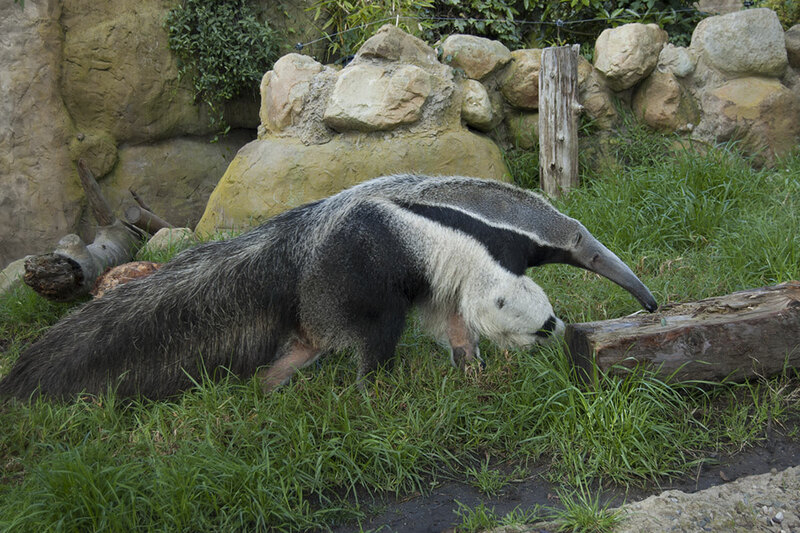 It’s hard to tell giant anteaters apart by looking at them. Males and females look exactly the same, with males being only slightly larger than females. Even the offspring look just like miniature versions of the adults as soon as they are born. This helps the offspring blend into the mother’s hair when it is riding on her back. Eat a special “insectivore mash” that keepers soak in hot water, like instant oatmeal, to get it gooey and sticky. This contains all the vitamins and minerals anteaters need to be healthy. ”Anteaters have an incredible sense of smell, and we sometimes sprinkle around herbs and spices, and bring in logs from other animal exhibits for them to sniff. The weirdest thing we do is bury our old shoes deep underground in the anteater enclosure. Those shoes go all over the Zoo and stink of other exhibits and other animals. The anteaters dig them up right away and investigate them thoroughly with their sensitive noses. Because they have no teeth, giant anteaters use their powerful stomach muscles and strong digestive juices to help break down their food. They can eat up to 35,000 ants and termites in a day, using their sharp claws to rip open anthills and termite mounds, and their long, sticky tongues to search out yummy insects. Giant anteaters are listed as Vulnerable on the IUCN Red List. They are considered Central America’s most threatened mammal, with population declines estimated at least 30% over the past 10 years. Causes appear to be habitat loss; deaths caused by fires, dogs, and traffic; being hunted for sport, food or as pests; and illegal trade as pets. Most coffee plantations replace all of the native vegetation with coffee shrubs in order to boost production. Shade-grown coffee farmers plant coffee in the shade of the tall trees, improving the flavor of the coffee while maintaining habitat for native wildlife.